Comp-N-Choke has been making the world's highest quality chokes for years. These chokes have won the NWTF's World Still Target Championship for many years. After shooting these chokes, and many others, I'm convinced the Comp-N-Choke are the best on the market. 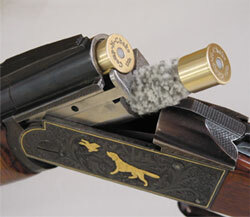 ... for your shotgun is often a hit and miss exercise and an expensive one too. And now with dozens of choke tubes on the market, there is more confusion than ever. "6 Tips for Choke & Ammo Selection" on the pop-up page and you will be very pleased with the devastating combination of choke and ammo. The loads in "Tip 2" are the best performing turkey loads on the market in terms of Value and Consistent patterns. .... I purchased at least 6 different turkey chokes, none of which gave me the tightest pattern I was looking for. This included the chokes that come with a new shotgun, and several after-market products. ... they are particularly weak when it comes to performance and quality. A choke is a precision made product, so I searched until I found the high quality, high performance Comp-N-Chokes made by experienced professionals.